In London, one of the wealthiest cities in the world, more than 25% of the population face food insecurity. Meanwhile, 3 million tonnes of nutritious surplus food from manufacturers, retailers, restaurants and the hospitality industry are sent to landfill every year. 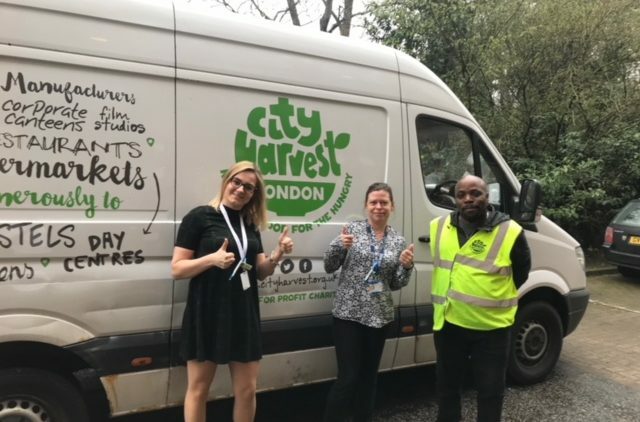 To combat this problem, we have linked with food waste charity, City Harvest who collect and deliver to over 100 homeless charities throughout London and some home counties. City Harvest is the leader in the “last mile” of food rescue in London. They offer a simple solution, connecting waste and want, safely, reliably and efficiently. 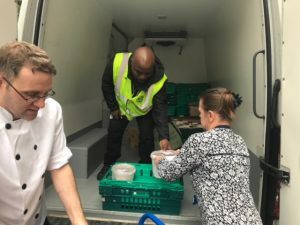 They help put surplus food to good use in a sustainable way by distributing to organisations that nourish London’s vulnerable men, women and children. City Harvest is the largest London-based food redistribution charity delivering over 8 tonnes of food each week free of charge to community food programmes that feed the homeless, individuals and families in transition, women in crisis, refugees, children and the elderly. Each week City Harvest vans deliver food that is used to serve more than 16,000 nutritious meals to people in need. They work with more than 120 community programs and 90 food donors. To date they have rescued 560 tonnes of nutritious food surplus. This has enabled local community organisations to serve more than 1,300,000 meals to the hungry. For every £1 that is invested in City Harvest, they distribute food that is 6 times greater in retail value. There is also a significant benefit to the planet. When healthy edible food is sent to landfill, it decomposes and releases methane, which is 20 times more noxious than other greenhouse gases. The quantity of food City Harvest delivered since inception, if sent to landfill would have resulted in 2,143 tonnes of greenhouse gases being released. The cumulative long-term effect of the services City Harvest provides will contribute to protecting the environment from climate change. When perfectly edible food is sent to landfill rather than to people, it wastes not just the food but all the resources that went into its production. 563 million litres of water were used in the production of the food City Harvest delivered, an amount that would have been wasted if City Harvest did not provide its redistribution services. This is the equivalent of wasting the water filling 220 Olympic sized swimming pools. “Implementation from a manager’s perspective couldn’t have been easier! We already had an ice cream freezer that wasn’t used and we had somewhere to store it that was easily accessible. It was just a matter of briefing the chefs so they knew to select food that is still safe to eat but we are unable to use again (such as a veggie soup or a few portions of pasta or cottage pie). We haven’t had to buy containers, we re-cycle plastic buckets and tubs. We just label them with an allergen sticker and that’s it. We do not have huge amounts of food waste as we run a tight ship. It is great to know are helping others less fortunate with the few meals that we haven’t sold. Some days we do not have anything to freeze but other days we send soup, curry or lasagne. Even if it is just three meals, it counts. The night before I need a collection I email City Harvest and their driver pops in and collects the food. So there you have it. Basically both parties sign an agreement to say that we will follow food safety procedures until the food is collected in a chilled van. We segment and freeze down any suitable portions, then email City Harvest when we have enough for them to come pick it up. As soon as it is collected, the trained City Harvest team transport, store, then reheat the food safely. It’s as simple as that. It helps thousands of people and the planet, so there really is no down side. We are actively encouraging all of our sites to pick up this fantastic initiative and we do hope that anyone else that may be reading this who is involved in food production also picks up this worthy cause. Discover how we are serious about sustainability.